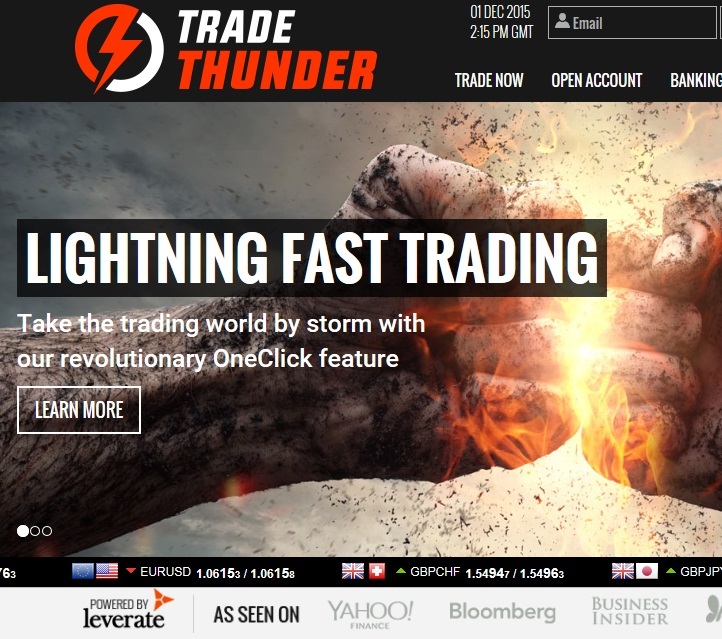 Trade Thunder is a new binary option broker that accepts traders from the US with an amazing trading platform. It is a UK based brokerage that was incorporated in 2015 as a subsidiary of LGK Industries, its parent company. This binary options platform is one of the first to operate on the new BX8 binary platform created by Leverate, a leading platform that has been providing Forex services for many years. With its a simple trading interface, the platform affords traders the unique feature known as “One-Click” trading that allows investors to execute their trades instantly with a simple click. 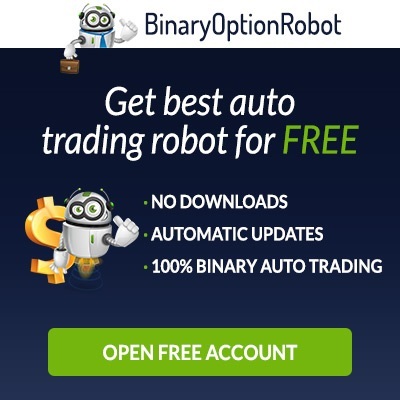 Like the name says, they have taken the binary options market by storm with innovative features that are being added continually in order to satisfy the many traders who are using this platform to place binary options trades. Despite their being new in the market, Trade Thunder is certainly among the most versatile trading platforms and their level of responsiveness to traders’ needs is top notch. With low minimums, a free demo account and no restriction bonuses, these aspects are among the few servings from their excellent list of features. Responsive and knowledgeable phone support and live chat is offered 24/6 across 4 countries, and the platform has been translated into 7 languages. Traders can also count on multiple strategy guides from the platform’s education department in addition to free trading signals which depend on the account level a trade is singed up to. Trade Thunder’s minimum requirements are definitely among the lowest in the market, with only $20 required to make a deposit and a minimum of $1 for each trade placed. This is quite ideal for traders who are not so financially enabled to afford the average requirement of $100-$500 that is the standard currently in the market with most binary options trading platforms. They also have the offer of a unique bonus of up to 100%, where traders earn the bonus while they trade. Their payouts are known to be as high as 91% and there are no restrictions when making withdrawals. Because Trade Thunder values innovativeness, they have embraced unique software, the BX8 Binary Platform, which offers investors a great trading experience. The platform that is developed by Leverate is user-friendly enough to provide a trader’s room that is unmatched. Built with a fascinating layout, the platform allows users the ability to execute multiple trades on a variety of assets without difficulty. As a pointer; a trader is able to highlight choices of assets of interest, locate binary options to trade with each asset chosen then select the way he/she wants the asset to move. 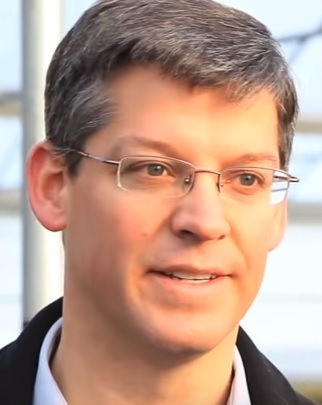 Unlike some trading platforms in the binary options scene, the trade dollar amount with the Trade Thunder brokerage is always set to zero, and this works especially well in eliminating executing trades for amounts that are more than originally intended – this does happen more often than anyone might think on most trading platforms. This one aspect will allows users to select the amounts they want to spend per trade, from the minimum $1 amount all the way up to the maximum amount allowed for each account level. And with the low trade minimum dollar amount, traders can afford to risk losing a few dollar amounts when going after a big return on investment. Since the binary options market had up until this point been largely dominated by two different types of trading software platforms only, it’s great to see software developers such as Leverate have finally brought some badly needed changes. This platform is designed to be fast and easy to navigate through a series of simple ‘One-Click’ functions, making it easy to place trades for any of the over 80 assets offered by Trade Thunder. 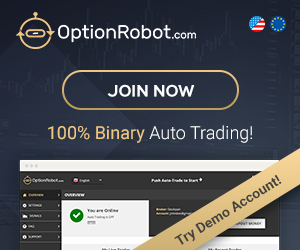 Binary options trading has gained a new level of real-time simplicity with the the “One- Click” trading feature, the major highlight of the trading room. Through simply clicking on the ‘Low’ or ‘High’ button, a user is able to activate a trade and do all the needed trading steps at once. This feature allows access to a raft of various expirations such that traders can set their default trade sizes through simply clicking a ‘Put’ or ‘Call’ option to execute a trade. The “One-Click” feature is set to save traders the trouble of having to go through so many execution steps just to place a binary options trade, and this certainly comes in handy given the importance of speed in the financial trade market. The One Click trading feature allows for easier trading as well, especially where the trade concerns the prediction of a fall in the price of a binary option. With this feature, traders only need to simply open a ‘put’ or ‘low’ option when they can predict a price fall below the strike or opening price occurring within a pre-selected expiry time. Trading in financial markets requires a massive movement in the asset’s price before a trader can register a decent return percentage and this feature makes the process so much easier. This account level requires a trader to make a minimum deposit of $200 – $599 to open, and it packs a 40% bonus upon signup. The standard account also includes an invite to attend two free webinars on instructional trading, an informative weekly review of the market by Trade Thunder as well as a free binary options trading e-book. This account level requires a trader to make a minimum deposit of $600 – $999 to open, and it packs a 60% bonus upon signup. The premium account also includes an invite to attend two free instructional trading webinars, two weeks of free trading signals, an informative weekly review of the market by Trade Thunder as well as a free binary options trading e-book. This account level requires a trader to make a minimum deposit of $1000 – $4999 to open, and it packs a 75% bonus upon signup. The pro account also includes an invite to attend four free instructional trading webinars, 3 risk free trades, one month of free trading signals, an informative weekly review of the market by Trade Thunder as well as a free binary options trading e-book. This account level requires a trader to make a minimum deposit of $5000 to open, and it packs a 100% bonus upon signup. The VIP account also includes an invite to attend all instructional trading webinars, binary option robot and five risk free trades, free trading signals, increased max trades to $500, an informative weekly review of the market by Trade Thunder as well as a free binary options trading e-book. 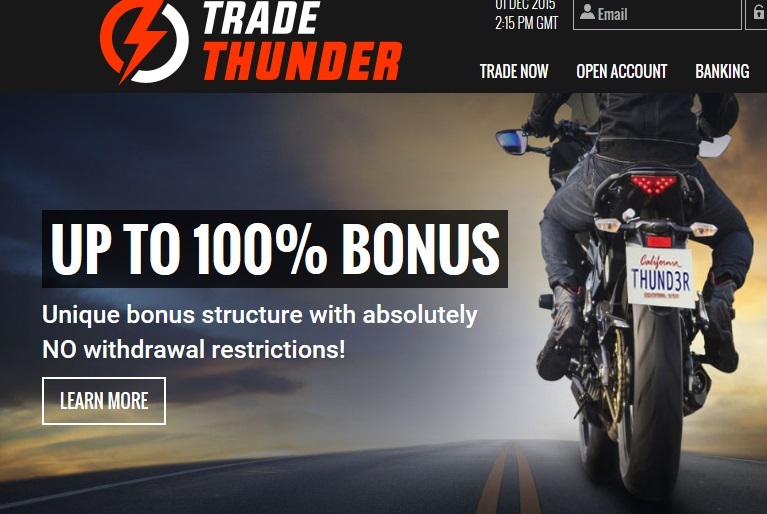 In addition to the accounts above, Trade Thunder also offers a free demo account and traders may register for it without making an initial deposit. This is certainly a nifty way for investors to test the trading platform and their trading strategies without risking any capital. And once they feel comfortable with the platform, they can then start placing live trades. Given the increased level of insecurities when trading online, traders want to ensure that their funds are secure. As such, Trade Thunder goes to great lengths in order to ensure the deposit interface affords traders a fast, easy and safe process when making deposits and withdrawals. 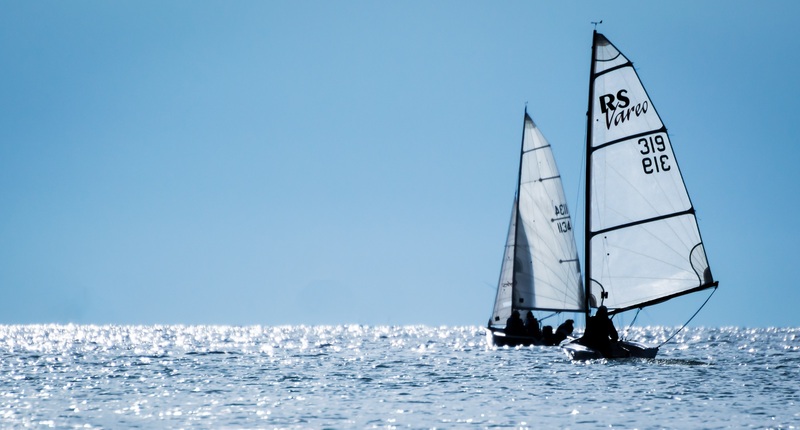 The broker is keen to ensure clients don’t lose their deposits to internet fraudsters. Depositing: This trading platform has among the lowest minimum deposit and trading amounts in the market. There’s a minimum deposit limit of $20 plus a maximum deposit limit of $5,000, and traders are also allowed to trade with as little as $1. 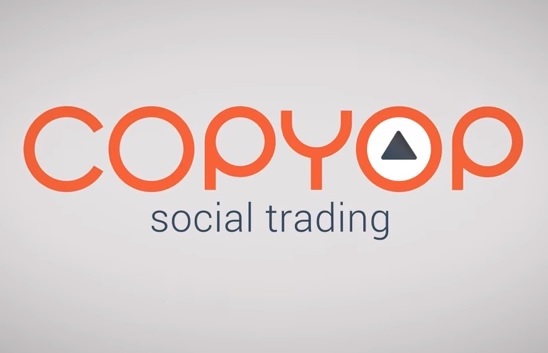 The platform offers traders the opportunity to trade in binary options no matter their level of income such that they can afford the overall capital risk involved. Users need to ensure they deposit from a single source and ascertain that the accounts state their names as well as countries of residence. This is to make sure registration information does not conflict with another person’s as any withdrawal or refund is made to the same account used to make the initial deposit. All clients of Trade Thunder have a guarantee that the privacy of all their personal data will be maintained. Withdrawing: This trading platform provides traders with a safe and hustle-free withdrawal process. The money which is in a trader’s account might include agreed on or voluntary promotions, bonuses plus any other amounts not directly deposited or gained from trading. However, traders cannot withdraw ‘Non-Deposited Funds’ until they have met certain conditions, although such conditions are quite easy to fulfill. For instance, a trader needs to deposit certain amounts, achieve a minimum volume of trading and perform a minimum number of trading transactions. When submitting a request to withdraw funds, the trader logs into his/her account, clicks on the withdrawal button then signs the withdrawal form by sending it by email. The site cannot process any request if beneficiary’s name doesn’t match the trading account’s name, and any request to transfer money to a 3rd party will not go through. After submitting a request, there’s a wait of up to 5 business days before funds are credited into the account, which is much less than the traditional wait period of up to several months for most brokers. Moreover, there are no withdrawal fees or charges when traders request to have their funds via credit card. Trading on the Trade Thunder platform is quite straightforward. After login, the trader selects any of the assets displayed on the trading screen. By clicking on each asset, be it a commodity or a currency, it loads onto the main viewing area and the trader is presented with four options, with expiry times of 5, 15, 30 and 60 minutes, to trade the chosen asset. Like with most brokers, Trade Thunder offers turbo options of 60 second trades although they aren’t in the main viewing window. Traders must remember that trading short expiry times of 1 minute or less requires much discipline and great skill. The fact that these options aren’t visible at the top of the interface will, in a way, help inexperienced traders stay out of the risky investments that come with trading on very short expiry times. The asset’s chart has a default setting of 1 hour meaning, investors who are trading shorter expiry of 5, 15, or 30 minutes ought to switch to the same chart view as their preferred time frame. For instance, when trading 5 minute expiry times, a trader should look at the 5 minute chart, not the hourly view. The chart’s time frame can be switched by a simple click on the preferred time. By using “One-Click” feature, traders are able to trade 60 second turbo options that are offered on a separate, dedicated screen panel labeled “FAVORITES 60 SEC”. From this panel, a trader is able to choose up to four different assets, and save them on the panel for easier access. The speed of each trade execution when using the “One-Click” feature allows users to explore 60 second trades with better timing and a higher level of accuracy. Upon opening a trade by choosing ‘high’ or ‘low’, the trader is presented with a real-time graphic tick chart automatically which allows him/her to follow the trade’s progress, the time left to the end, the entry price, current price, as well as the payout which is displayed either in percentage or in dollar amount. First-time bonus: Not many binary options platform greet their traders with surprising ‘welcome’ gifts and Trade Thunder is one of a kind when it comes to appreciating traders who choose to trade with them. First-time depositors are awarded a bonus of up to 100%, depending on the account level and deposit amount. 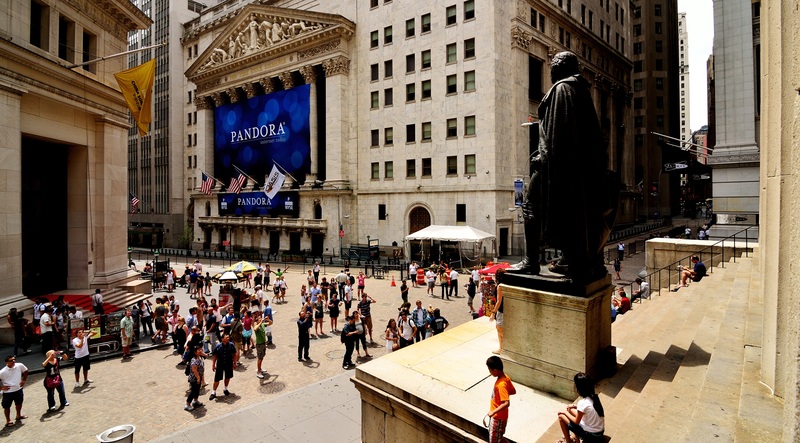 Oftentimes, the broker will surprise customers using its platform with re-loaded bonuses. Referral bonus: For every referral a trader refers to Trade Thunder, that trader earns a $50 bonus if the friend deposits anything above $300. The experience at this platform will make traders refer as many friends as possible to win this bonus. Unlike traditional Deposit Bonuses offered by other brokers, investors at Trade Thunder don’t have to trade a volume of up to 50 times their bonus amounts before they can withdraw their funds. The broker only requires users to attain a volume of 30 times of the bonus amount to earn the total bonus. There’s no other broker in the market currently with such a low requirement. Moreover, every time traders attain trading volumes of 3 times the bonus amount, they’re awarded 10% of their bonuses. The customer service support team at TradeThunder quite extremely courteous, responsive and helpful. Customer support is availed to users 24/6 via Phone, Live chat and Email across four countries, with speedy response times even during weekends.The education center has great tools and materials for both novice and professional traders that includes strategy guides,articles on binary options trading, market news, an e-book, a variety of training videos, earnings calendar and free signals. The Trade Thunder trading platform is really exceptional portal website with which to place binary options trades in. Over the little time they have been on the scene, they have proven themselves to be quite trustworthy and they also have unique trading software platform which will be of great help for traders who want to be as successful as possible. This trading portal comes highly recommended, so for those looking to start trading binary options, or are looking to try a new broker who does things a little differently from the rest, this site has all the ingredients necessary to make any trader earn profit more consistently. Stock Trading before the Announcement of Tender Offers: Insider Trading or Market Anticipation?